The goal of PhantomJS is different than Selenium Webdriver . The purpose of running tests with PhantomJS is to quickly identify the first possible problems, much like exploratory testing. Imagine if the web application is a web-based email client and QA Tester mistakenly break the sign in screen. It would save a lot of time if such sign in problem can be detected as early as possible before launching the extensive mail functionalities tests in a variety of web browsers. This particular objective is achievable because PhantomJS can run quite well on the command-line and it has near-zero dependencies. It fits nicely during the development workflow, e.g. as part of git precommit hook, and also the initial testing stage in the build/continuous integration server. Since the latest PhantomJS already includes built-in support for WebDriver, it is also possible to run the exact same tests both with PhantomJS and with the typical WebDriver environment. Selenium simply automates web browsers. PhantomJS is a headless browser that could be used to speed run the automated tests developed using either Selenium IDE or WebDriver. Execution speed is the key in PhantomJS. Selenium is basically a suite of tools that are required for automating web browsers across multiple platforms. Packaged with the support of leading browser vendors, Selenium is being regarded as the core technology that’s used in an unlimited number of APIs, automation tools and frameworks. Selenium Webdriver can be controlled by multiple programming languages and testing frameworks, it runs in multiple browsers and operating systems. Selenium permits an automated control of real browsers on real operating systems, thereby ensuring that the tests are too close to real user experience. Keep in mind Selenium bindings can be used for controlling PhantomJS, covering over ninety of the testing requirements. For extra powerful testing, Selenium permits QA Tester to set up additional browser connections without the need for altering even a single line of code. On the other hand, PhantomJS wouldn’t be a good choice for web app testers as it serves as a single version of WebKit. In short if you prefer to use headless browsers for testing, QA Tester can choose either Selenium or PhantomJS, depending on your requirements. There is no superior framework. It depends on the QA Tester. Selenium is an open source suite of tools to automate web browsers across many platforms. Protractor is an end-to-end open source test framework for AngularJS applications. Selenium works great for testing AngularJS, the only problem is dealing with synchronization issues. Selenium is in fact a de facto tool in the open source market for browser automation. QA Engineer can work with Selenium in almost every popular language. Protractor is a new tool in the web testing market although based based on the WebDriverJS. The correct answer on this QA interview question would be that Selenium or Protractor answer is totally depends upon the project requirement, team knowledge and management preferences. If your application is not built on top of angular, you can use webdriver on top of any other languages you prefer. It will not be smart to declare which has what advantage over other, both tool are great and help test engineer to make browser automation flawless and web sites more reliable. Valeriy Shershnyov is a former engineer turned "entrepreneur". He spent a little over 10 years working as a software development engineer for various companies, including Microsoft. He went on to co-found a startup, Alteroxity, which claims to help authors publish ebooks that are already "done for you" -- that includes the writing, the creation, the publishing, and even "dozens of honest positive reviews". The company appears genuine, according to public records, but its main source of sales is Shershnyov's catfishing scheme. To date, it's generated over $3 million in revenue. For two years, Shershnyov has run a powerful and complex database, which was hosted on an Azure instance by Microsoft. The server hosted a table containing 83,899 fake Amazon accounts (an easy feat given that, when we checked, Amazon doesn't verify email accounts). At any given time of the day, dozens of those accounts could be pushed through one of over 200 proxy servers -- provided by a third-party internet company -- which makes it harder for Amazon to detect the logins. The server installed the Selenium WebDriver, a browser automation tool, which simulates a real person typing in the accounts' usernames and passwords, one after the other. Selenium vs QTP debate is over. Growing evidence indicates that Selenium WebDriver experience is a highly sought after skill. Opening for Selenium job overtook QTP jobs in 2011 and continue the trend. Is Selenium IDE a good choice for automated testing? 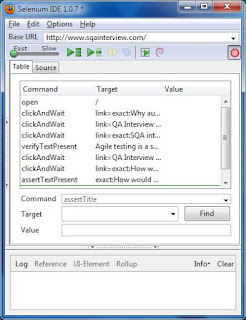 Even QA Testers, who only started to work with Selenium, know that Selenium IDE is an integrated development environment for Selenium scripts implemented as a Firefox extension. It helps to perform some automated functional browser testing and allows QA Tester to record, edit, and debug tests. Selenium IDE is a great tool for simple test cases and not that suitable for complex scenarios, where it would be better to use Selenium Webdriver. In the same time IDE could be used for trivial automation testing, to repeat some routine and lightweight tasks that let your web application ready to be tested. Keep in mind Selenium IDE is a prototyping tool for building test scripts. It is a Firefox plugin and provides an easy-to-use interface for developing automated tests. Selenium IDE has a recording feature, which records user actions as they are performed and then exports them as a reusable script in one of many programming languages that can be later executed. Selenium 2 Testing Tools: Beginner's Guide book review should be started with the author introduction: David Burns is a Senior Software Engineer in Test at Mozilla Corporation and has been doing test automation for many years. David is a Core Committer at Selenium Open Source Community and familiar with the tricks and issues that go with Selenium 2. After the success of the first edition of the book, David updated the wrote the second edition of this book in a fast-paced but friendly and engaging approach. Selenium 2 Testing Tools: Beginner's Guide: Beginner's Guide will help QA Tester start with testing web applications using Selenium from scratch. It covers the wide variety of topics from setting up the Java environment to running tests on mobile devices, it contains all the information to get a beginner up and running on using Selenium 2. An essential overview of the WebDriver is presented next followed by migrating test cases from Selenium RC to Selenium WebDriver. Once all the tests have been created the book guides how QA Tester can speed up the execution of automated test cases by running them in parallel and reduce build time using Selenium Grid. The book is created in the guide style which emphasizes the concept of learning by doing and it is full of examples and code samples.